MALTBY, Wash. -- The Washington State Department of Ecology will honor two people who teamed up to protect an environmentally sensitive bog in Snohomish County. Community activist Randy Whalen and Deputy Snohomish County Executive Mark Ericks will receive the Environmental Excellence Award during an Earth Day ceremony Wednesday. In 2012 Whalen challenged a proposed housing development on the banks of Hooven Bog near Maltby. The plan was to remove a forest of trees that are credited with buffering the bog from nearby housing and roads. Whalen successfully appealed the county's approval of permits for the development and later, the county agreed to buy the land and preserve it from development. The Department of Ecology said it takes hundreds or thousands of years for wetlands like the Hooven Bog to form. Plant matter decays and fills the lake bed, creating peat. 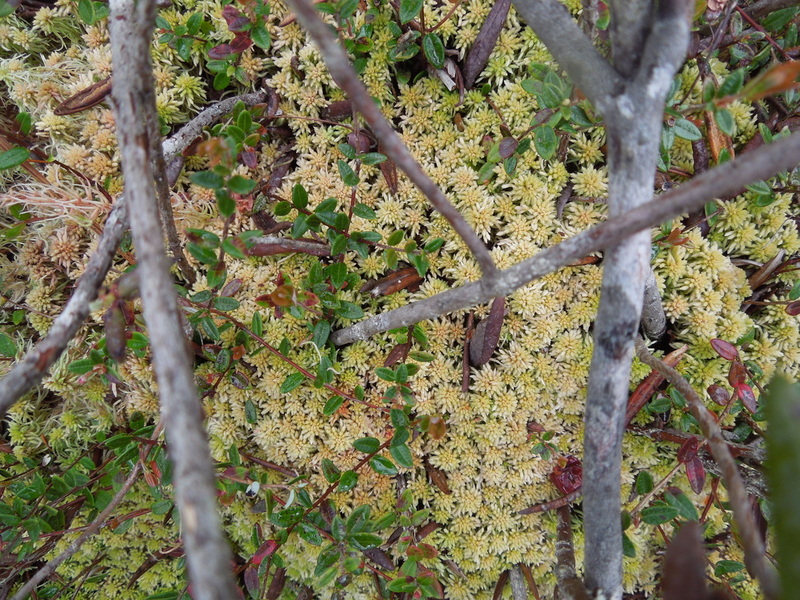 Whalen said the bog near his home hosts several rare and unique plant and animal species. ** We would like to say thank you to Gary Chittim, all of King 5 for this very newsworthy story. EVERETT – A citizen activist and a county official received formal recognition today from the Washington Department of Ecology for their leadership in preserving an unusual wetland in Snohomish County. Community activist Randall Whalen and Deputy County Executive Mark Ericks received the Environmental Excellence Award in an Earth Day ceremony, hosted by County Executive John Lovick in his office. “Randy and Mark are directly responsible for protecting Hooven Bog,” said Josh Baldi, director of Ecology’s Northwest Region, who presented the awards. “We applaud their success in preserving a place where people can see its plant and animal life, and the way it supplies cool, clean water. People like Randy and Mark give us hope that we can not only protect special places like Hooven Bog, but also restore the health of Puget Sound." 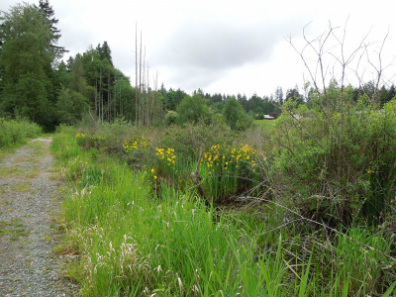 The two led a grass-roots effort to protect 25 acres of wetland and forest between Woodinville and Maltby. 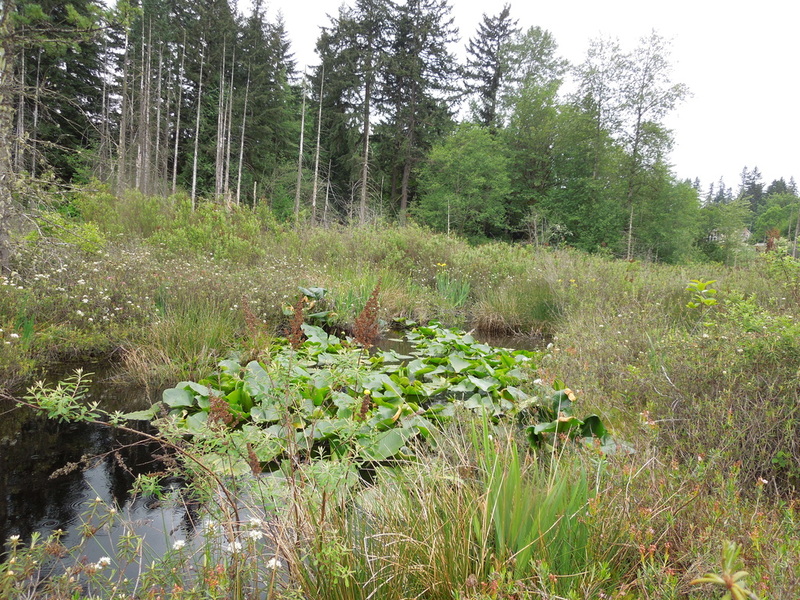 Hooven Bog and its surrounding area are an example of bog and fen wetland that has become increasingly rare in western Washington. Whalen, a local resident and a founder and director of Bear Creek Headwaters, led a legal battle against residential development along the bog’s southern shore. Using his own funds, his challenge reached the state Court of Appeals. He also worked to raise public awareness of Hooven Bog’s ecological value and the proposed development’s potential environmental costs. His efforts caught the attention of Ericks, who assembled a county funding package to acquire and preserve the majority of Hooven Bog and adjoining forested lands. The County Council approved the plan on April 23, 2014. The purchase became final that summer. Snohomish County Parks and Recreation will manage the property as a natural area. Bogs form over hundreds or thousands of years when plant matter decays and fills a lake bed, creating peat. Fens are similar, but can form in places where the water table is high and tend to have year-round flowing water. Both help release cool and clear water, and each is home to unique plant and animal communities. Ecology wetland expert Paul Anderson describes Hooven Bog as a high-quality, undisturbed wetland that supports state threatened, endangered, and sensitive plant species. It is part of the headwaters of a major tributary to Bear Creek. In Redmond, about 11 miles south, Bear Creek joins the Sammamish River, which flows into Lake Washington. Ecology’s ECOconnect blog has photos and more information about Hooven Bog and today’s award. The Environmental Excellence Award is Ecology’s highest recognition for individuals, businesses, and organizations that show leadership, innovation, or extraordinary service in protecting, improving, or cleaning up Washington’s environment. Published: Thursday, April 23, 2015, 12:01 a.m.
A Maltby man who led the effort to preserve a rare peat bog next to his property was honored by the state Department of Ecology on Wednesday.The state recognized Randy Whalen with a Regional Environmental Excellence Award for his success in preserving Hooven Bog.The developers who owned the bog had planned to build five luxury homes within 100 feet of the shoreline and log the area. Whalen challenged their plans through land-use hearings and court appeals, paying out of his own pocket.The Daily Herald highlighted the situation in a front-page article Feb. 23, 2014.The state also recognized Deputy County Executive Mark Ericks with an Environmental Excellence Award for spearheading the county’s purchase of the land for conservation last year.The county paid $1.6 million for about 40 acres.The awards presentation coincided with Earth Day.The bog lies immediately north of the county line, less than a mile from Highway 522.Similar nutrient-poor, acidic wetlands with floating moss mats and stunted trees are mostly confined to Snohomish and King counties in Washington. They likely formed after glaciers retreated about 10,000 years ago. The day's meeting, celebration and tour was a HUGE success and we could not thank enough each wonderful soul for being there today. Groups included the Native Plant Society and Pilchuck Audubon Society, to name a few and we will put up a formal list of everyone that made it today. Thank you to biologist Sarah Cooke for the educational presentation on the ecology of the bog. You can review her slides if you CLICK HERE. We would like to thank John Lovick and Mark Ericks for their dedicated work well done and words of hope and inspiration for the future. This event was hosted by SnoKing Watershed Council, which we are so grateful for. Bringing all of our combined efforts together, from organizations to active community citizens and neighbors, like Mark Ericks said, is the key to making things happen and we were fortunate to watch it work. Thank you Mickie Gundersen, for being the fire that helped pushed this achievement to the end. You are a great addition to the Bear Creek Headwaters organization and are truly valued. Randy Whalen, we applaud you, thank you and congratulations from all the supporters! CHEERS! HOOVEN BOG HAS BEEN SAVED!!!! AS YOU WILL SEE, AROUND 9 MINUTE 30 SECOND MARK IN THE VIDEO HERE, THE SNOHOMISH COUNTY COUNCIL VOTED UNANIMOUSLY TO PURCHASE HOOVEN BOG AND THE 8.6 ACRES NEXT TO IT FOR AN INTERPRETIVE CENTER FACILITY. This will allow people to learn about the bog without actually walking around in it. Future generations will be able to visit this ancient site and learn more about our green earth and how important it is to take care of it. We owe a deep debt of gratitude to our administration, Snohomish County Executive, John Lovick, and his Deputy Executive, Mark Ericks. Without them and their passion for the environment, this would have never happened. The bog may have been ruined by development. Your continued support played a huge part in this great event. There were between 20 and 30 people at the hearing. Mark Ericks received over 150 letters of support. We hope you come to celebrate with us this Sunday the 27th at the Brightwater Treatment Plant community center. Click title to open article. View from pathway that runs through the bog. We have held tours for those interested in experiencing The Bog and would love to have you come check it out too, just leave us a message on our contact page! 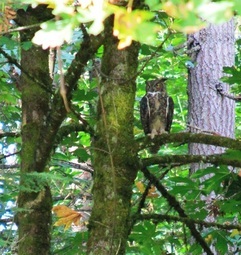 ANIMAL ACTIVITY: Neighbors of the bog shared pictures of one of the many owls active in the last couple months since November 2013. We were invited to FORTERRA's 18th Annual Breakfast at the Convention Center in Seattle this past Wednesday, May 29th 2013, where we were able to experience the passion and dedication to their mission "One Region, One Future". A renowned wetland biologist and an official from the Department of Natural Resources (DNR) recently visited Hooven Bog. In their investigation of the bog, they found Utricularia Intermedia, a federal and state listed plant also referred to as a bladderwort. They are busy working on a compilation of the data they collected from the visit. Hooven bog has more variety biodiversity than other wetlands the biologists have seen before. It's rare to have more than one habitat but Hooven houses 4! It is likely that Hooven Bog, in its uniqueness, will make listing in the Natural Heritage Program. A detailed report on the wetland from the biologist visit is forthcoming. Hooven Bog was added to the WIRA8 Salmon Recovery Plan 3-year work plan and the 10-year start list. Hooven Bog is a headwaters component to the Cottage Lake Creek headwaters, which makes it a tier-1 acquisition goal therefore, making it highest priority. We attended the Salmon Recovery Conference in Vancouver, WA, May 14-15th 2013 at the Vancouver Convention Center with 560+ participants from Washington D.C. to British Columbia, Canada to our own backyard. The event was very uplifting for this whole project! More big plans to come. This is where YOU come in! We need everyone's help to continue on with this project to put an end to the current ongoing degradation by protecting Hooven Bog before extensive restoration is required. Stay posted at our HELP NEEDED NOW PAGE to learn about how you can help, volunteer or donate. Panoramic (blurry) of the bog and Randy. Send us your favorite photos of the flora and fauna in your part of the headwaters. Tell us your stories, share your knowledge.